While we’re at work during the day, Loki stays outside in his 10×10 dog run. He’s got a nice insulated doghouse and besides the weather being really cold in the mornings when we leave him, we haven’t had any problems. Sunday when we got home from work, the door to his run was off the hinges and inside the run, and Loki was curled up inside his doghouse, not wanting to come out. R eventually coaxed him out, and he limped his way into the house, not at all using his back leg. His run when we first put it up… it has a roof on it now. And the door is knocked off. Once we got him inside, he got up onto the couch in front of the woodstove and I started a fire. I was watching him closely, and noticed that he was showing symptoms of shock. Shaking, cold, sticky gums, unresponsive. We wrapped him up in a blanket and I texted my former boss from the animal sanctuary in Utah where we used to work. She helped walk me through what to do for him, but both her and I had this sinking feeling that Loki might not make it through the night. I’ve worked with animals for a long time, and I’ve seen animals in shock not make it more than a few hours. We were concerned. And you have to deal with the shock before dealing with any injuries, so we weren’t even thinking about his leg at this point. We spooned water into his mouth and made sure he was as warm as possible. I also managed to get a hold of a 24 hour emergency vet in town (who was busy with a sick horse), who gave me an ibuprofen dose for Loki and said to call him in the morning if he wasn’t any better. After a couple of hours in front of the fire, Loki was looking brighter and more responsive. He made it through the night and we brought him with us to work the next day so he could have a nice R&R day in the truck. The shock was gone and he was tired but more himself. He even barked at strangers. Since he was feeling better I was able to feel up and down his hurt leg, and felt a break. R felt it too. Loki’s leg is definitely broken. Thank goodness he’s not a growly, bitey nightmare when he’s in pain. So today is our Saturday from work and we’re home all day. Besides doing normal off-grid-Winter-stuff, like moving firewood around, shoveling, and generally keeping the house warm and tidy, today has also been a good day for Loki to just rest and we can keep an eye on him. 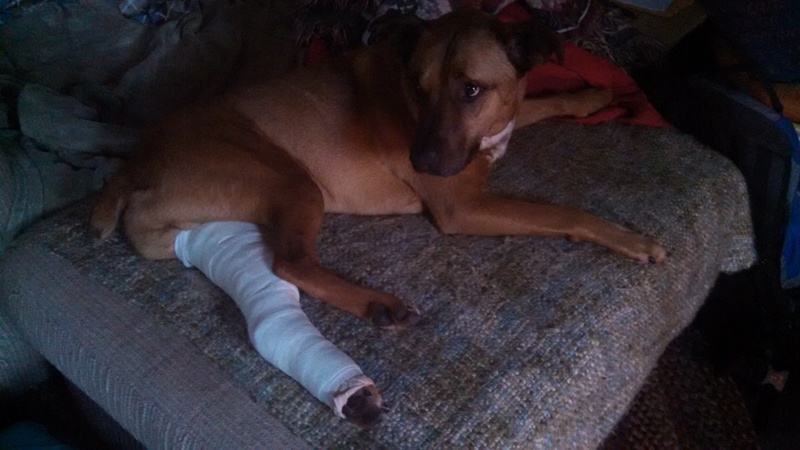 We also splinted his leg. He got a little grumbly when we started messing with it, but he was ok. He’s been really tired and sleeping a lot. Poor guy. He’s summoned to bedrest! It’s going to be a long few weeks. He’ll be coming with us to work everyday for the foreseeable future, mostly so we can keep an eye on him and his movement will be restricted. I’m just happy he survived his night of shock. And no, we have no idea what happened to him. Maybe he just got tangled in his run door, maybe he got out and got hit by a car… who knows. There was no blood or punctures or anything like that. Whatever happened, if he was out, he managed to limp his way home. Feeling better the next night. Things can always be worse! Loki is home and alive and ok. With a broken leg, but he’s managing. Dogs are good on 3 legs. He can even get himself in and out of the truck still. So keep up some good thoughts for our Loki Monster… Poor broken pup. And with the animal losses we’ve experienced this year–Sweet Amelia, Archie, and Zeppy from last year–we just couldn’t handle Loki not making it! Feeling nostalgic… We miss our sweet duck, and still have hopes that Archie will make it back home.